Dr. Balachandran’s research focuses on the discovery of new active drugs from the plants that contribute to human health benefits, especially those that exhibit anti-cancer and immune enhancing properties. 1. 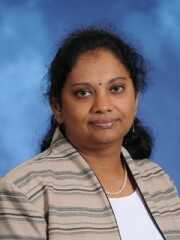 In partnership with UMMC-Cancer Institute at Jackson, Mississippi, she searches for more effective approaches in cancer therapy that will include both modern medical practices in addition to traditional medicine from various countries like India and China. One of the main focuses of her research deals with the development of new molecular biological HTS operation (high throughput screens) to run complex anti-cancer battery of screens, targeting several signal transduction pathways known to be involved in the expression of cancer. The extracts/compounds that are capable of blocking specific pathways are further evaluated for their mechanism of action and drug development. 2. Evaluation of in vivo immune stimulating activity of botanical extracts/preparation in animal models.